Admission procedure spans several stages involving FUNAAB, JAMB and candidates. Consequently, admission is being offered in piecemeal. Soon after FUNAAB commences uploading of offered courses to candidates on JAMB's Central Admission Processing System - CAPS, admission status of successful candidates will change. Successful candidates are expected to either Accept the offer to secure their admission OR Reject the offer to seek alternative possibilities. 2. 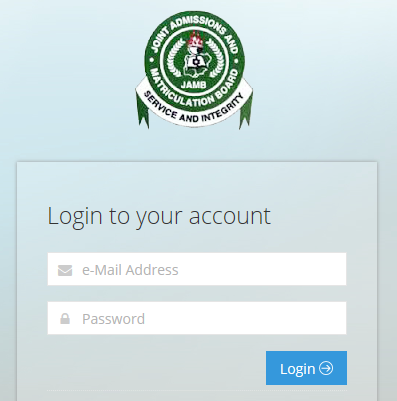 Login in with your e-Mail Address and password; if successful you will be able to assess JAMB’s application portal. 3. 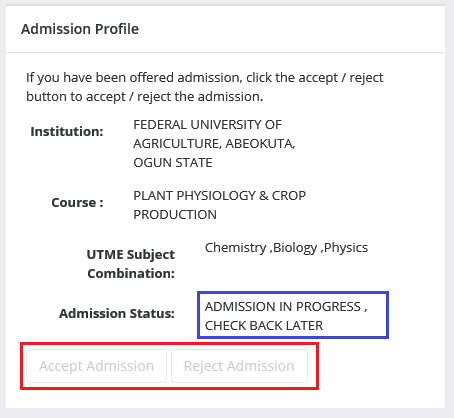 On the menu bar (System: Left column; Phone: click on the icon to display menu bar) click on Admission then Check 2018 UTME/DE Admission Status on CAPS . This will take you to JAMB’s Central Admission Processing System | CAPS website. 4. From the menu, click on Admission Status. Your Candidate Profile and Admission Profile dashboard is displayed. If not, click the "Check Admission Status" under your Registration Number. If you have been offered admission the Accepted Admission and Reject Admission buttons will be active (clickable) as highlighted below. 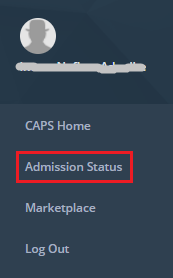 Admission Status details (highlighted in blue) may differ. NOTE: If not yet offered admission, please keep checking. Will my coming to INHURD guarantee me admission into FUNAAB?